With its origin going back to the industrial colony "Stadt des KdF-Wagens", created to house the workers of the Volkswagen Works established then, and still closely connected with the well-being of that company, the City of Wolfsburg is a typical example of planned urban development focusing on economic impetus. Here, the creation of a cultural identity and the integration of different cultures combine with an effort to transform the place into a centre offering state-of-the-art services and leisure amenities. The development of the Klieversberg-Castle urban axis illustrates how cultural changes have affected and shaped urban planning. Over the years, the city's major buildings for cultural purposes have been constructed along this axis, thus revealing evidence of the development from the beginnings in 1938 up to the forward-looking plans of the city. Four different development stages are described. The location, at the centre of the German Reich, is in a thinly populated area close to the industrial triangle of Braunschweig-Salzgitter-Magdeburg; the railway route and the Mittellandkanal form an east-west transport axis with easy access to the planned northern Autobahn - these were the reasons the new car factory was located in 1938 in the glacial valley of the Aller river. Peter Koller, whose urban development plan for a town housing 90,000 people was implemented, planned to strictly separate the factory in the north from the town in the south. 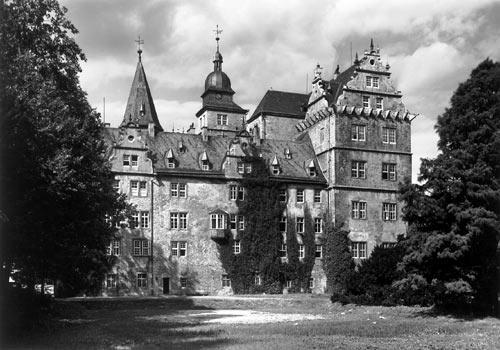 Geographical landmarks such as the Klieversberg and an existing renaissance Castle were the cornerstones of his concept. Initial construction activities in the Wellekamp and Schillerteich districts were to expand towards a central shopping axis - Rothehofer Straße, later Porschestraße - with the Castle forming its historical point of reference. Most of the rural dwellings existing in the area of the town soon gave way to the new town's expanding construction activities. After 1942, the focus was on arms production, which put an end to any urban building. With only 3,000 flats completed by then, the townscape - until the end of the war - was characterized mainly by shacks. Whereas the essential administrative organizations were accommodated in temporary offices located at Steimker Berg, wartime social life took place in a huge barn-like "leisure time" building seating up to 5,000 people. It was the Tullio Cianetti Hall, named after the then Italian Industrial Workers Association's President and erected on the largest square of the so-called nationalist community's camp. Also after the war ended, the flood of refugees and people looking for work forced many people to adopt such spartan forms of life, and housing remained a burning issue late into the 1950's. One of the essential tasks to be accomplished in the 1950's and 1960's was - next to coping with housing shortage - to create a complete new cultural and social infrastructure. Numerous schools, sports and playing fields, and swimming pools, as well as 26 new churches, were evidence of the enormous efforts made in those years. By the early 1960's, Porschestraße is almost entirely lined with buildings: department stores, cafés and the first cinemas. At the southern end of Porschestraße it was the market square and the town hall that constitute a traditional city centre. Here, in 1958, the local administration staff finally moved into a prestigious building, having worked for so many years in shacks. A typical sign of the democratization efforts made in the 1950's, the town hall buildings reflected the principle of separation of powers. The VW Board, aware of the company's responsibility for its employees, undertook to contribute to the basic cultural infrastructure of the city as a counterbalance to the workers' industrial working environment. 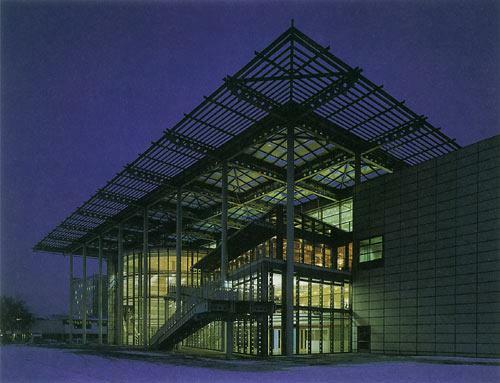 The first cultural projects constructed thanks to VW's financial support were the functional Congress Centre building, the Culture Centre and the theatre. 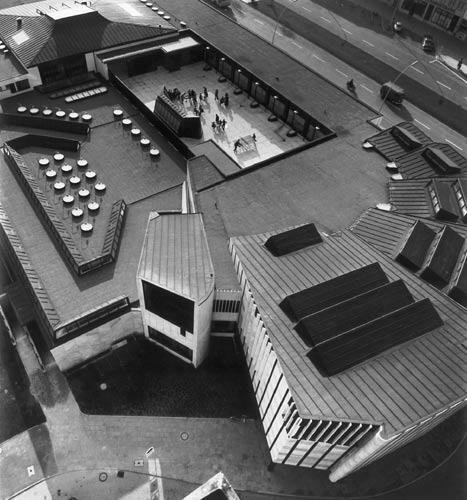 Renowned architects presented their outstanding designs in small international competitions: Finnish architect Alvar Aalto's concept went beyond the basic functions of a culture centre as he aimed at creating a place for people to meet and discuss: hence the central roof terrace, around which all other rooms were arranged. Upon its completion in 1962, the building - housing the public library, a youth centre and an adult education centre - soon became the pulsating heart of the city. A broad discussion developed on the subject of a theatre since industrial workers are not really traditional theatergoers. Hans Scharoun won the competition with his concept of an elongated building that occupied the entire slope of the Klieversberg, thus forming the southern end of the so-called Koller axis, with the Castle at its northern end. The Castle, one of the few historic islands in the modern city, is an essential point of identification though it has long remained somewhat off the beaten track due to the strict separation of functional areas - the city in the south, the factory in the north. It was only in 1957 that the town approached the Castle: straight across the newly-built Berlin Bridge. In 1961 the local administration acquired the renaissance building which, in addition to rooms for official events, the municipal art gallery and the local arts association, now also houses a small group of artists, well-known beyond the limits of the region, who are bringing life back to the ancient building. The intention to develop a pulsating business centre along a central city axis - a goal pursued since the mid-1950's - was being pressed ahead with in the 1970's when Porschestraße was subdivided into three sections. Its southern section, with its ensemble of prestigious edifices already completed, led right into a landscaped culture park at the foot of the Klieversberg. All the remaining efforts focused on the middle section of the axis with its high traffic volume. By 1981, its transformation into a pedestrian area had been accomplished, its width broken up by little shop pavilions fitted in to add a touch of bazaar atmosphere - a "shopscape" to attract shoppers and promote urban life. The traffic flow banned from this section was channeled into the bypasses encircling the city. The northern section of Porschestraße was converted, too, the result of a planning competition in 1987. The winning design, whose consistent concept convinced the jurors, provided for a straight connection from railway and central bus station to city centre to replace the existing roundabout. So, in the 1990's, a multi-level traffic junction was built, with a four-lane trunk road alongside the Mittellandkanal through a tunnel. Whereas the essential traffic projects were implemented in the 1970's and 1980's, economies became a must in those years, affecting also ongoing cultural projects such as the construction of the theatre. It was only fifteen years later that another major project could be launched; on one of the biggest undeveloped areas of the city, located between the Culture Centre and the theatre, an arts museum was to make a contribution of its own. Peter Schweger's winning concept was both a large forum providing space for the different ways of how modern art can be expressed and a southern border point of the city. The self-confident body of the museum constitutes a landmark on the southern edge of the city axis, adding a new dimension to the inner city. Wolfsburg AG, a public-private partnership between the City of Wolfsburg and Volkswagen AG with each partner investing 50% of the capital, set structural changes in train in 1998. The objective was to halve unemployment within five years. Whereas the need to recruit more labour intensified the industrial monostructure for many years, efforts are now being made to attract business start-ups in the short term by offering optimum conditions. One of the four divisions of "Autovision" will be "Erlebniswelt", focuses on entertainment and leisure amenities. It relies mainly on private investment. Planning is not restricted to the urban outskirts but affects most of the areas along the city axis where any existing threads in the cultural, sports, historic or shopping areas are taken up. The first areas to be realized, east and south of the Autostadt, were "Sports and Recreation" and "Discovery and Entertainment". It was the EXPO event in nearby Hanover that induced Volkswagen AG to build the Autostadt, a compact thematic area presenting the company's entire range of cars at the Wolfsburg headquarters. This new service centre, appealing to visitors with a multitude of leisure amenities, aims at generating lasting customer loyalty. Within only two years the spacious water park area with seven brand pavilions and a service point for the direct delivery of cars to their new owners was built. The new city bridge across the canal extends the Porschestraße axis beyond its northern end at the railway station, thus lifting the strict division of city and factory and opening part of the factory premises permanently to the public. When in 1998 the railway station was converted into a state-of-the art ICE stop, its forecourt adopted a new significance: it is now, next to being the link to the Autostadt, the essential gate to the City. The location of the Science Centre project "Phaeno" and an international architecture competition to redesign the place highlight the significance of the railway as a means of transportation in a city that used to be tailored to the car. The innovative Science Centre, quite different from traditional museums owing to its fascinating concept of actively imparting information, is to become a cultural component appealing strongly to the region. Zaha Hadid's prizewinning design elevates the entire exhibition floor to a height of 6.5 meters, thus generating an urban area underneath the disc-shaped building as an interactive link to the city centre. Several public functions will move into this artificially created topography which, by 2003, is going to mark an urban place at the heart of an intersection.